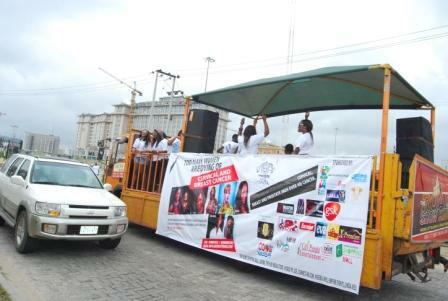 The Exquisite Magazine against Cancer Walk (formally known as the Exquisite Fashion Party) is an event which has been held quarterly since 2006. 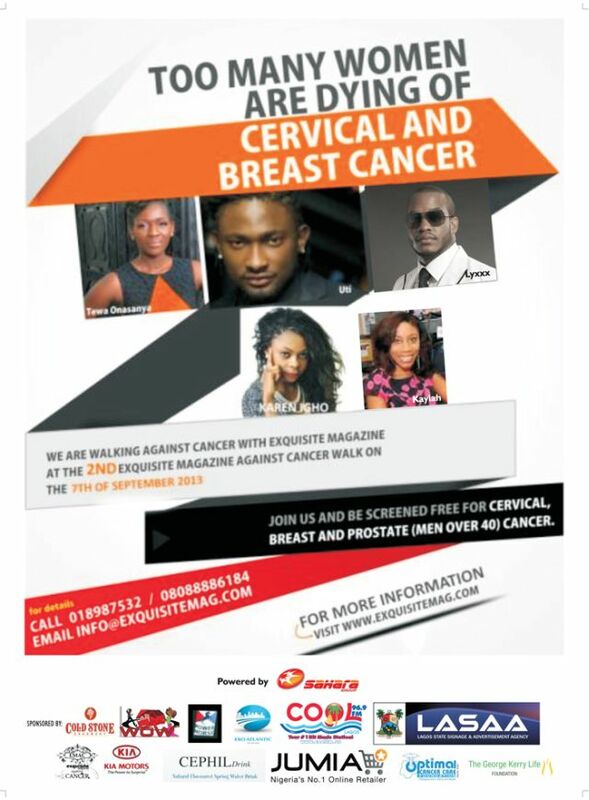 EMAC is held to increase the awareness for cervical, breast and prostate cancer and also screen people free. Yearly, the Exquisite Magazine team has been able to screen a number of people free of charge at the exquisite fashion party. 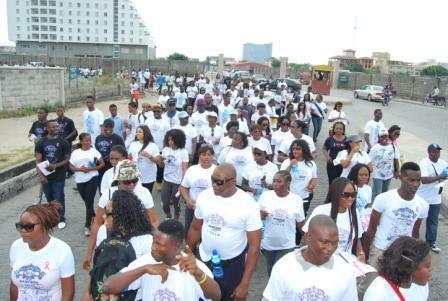 Instead of a party, the Exquisite Magazine Against Cancer walk has been created with the aim of screening even more people. In the last 2 years, 25% of the people screened had early stages of cervical cancer and the team aims to help raise more awareness for cancer and highlight the importance of early detection. Prostate cancer where eight in ten black men will be affected in their lifetime. We have been informed by the editor of the magazine that volunteers are needed to help distribute fliers next week as well as help on the day of the walk to coordinate people and offer general assistance. Don’t just remain with the crowd-contribute! If you are already signed up with us, kindly leave a comment saying “I am interested.” If you have not, fill the form below. Limited spaces are available. Kindly apply by Sunday, September 1, 2013. We’d like the whole house to get involved. Chances are that if this issue does not affect you, it affects your relative or loved one who is unemployed, at home on a boring 3 months holiday, or even thrown into idleness due to the prevailing and enduring strike action by ASUU. It would be great if we can see more and more innovative solutions around youth engagements and bring already existing, effective ones to light and acceptability! Wouldn’t you like that there are easily accessible opportunities to work remotely from your phone/home for a project outsourcing platform or be engaged often in volunteering programmes or learn about meaningful associations and groups you can join or take up a holiday or quarter-day job or be accepted on a work shadowing programme to experience a week in the life of your role model? The possibilities are endless but these avenues to career enhancement are not exactly the norm in Nigeria. We don’t need to have to know somebody that knows somebody that is a friend or uncle to somebody that can help us get ahead in our career. Let’s push the discussion now! On Facebook and Twitter, just make a post commenting on the issue but include #EngageNaijaYouth in your post. Let’s have a meaningful holiday! Season’s greetings. Since mainstream jobs, internships and entrepreneurship have left us tens of millions of idle young people, in what other effective ways can we keep our youth productively engaged? In the few days to your birthday, you probably take a moment to find reasons to celebrate and map out strategies for a greater year. The International Youth Day is going to be celebrated again on August 12. To mark this special day, the Volunteer in Nigeria network in partnership with Coinaire Games has started off a nationwide social media discussion using the hashtag #EngageNaijaYouth on Twitter and Facebook. The intent is to begin conversations around other youth engagements (aside the already vigorously preached mainstream jobs, internships and entrepreneurship which have left us the reality of tens of millions of idle youth) that can keep our youth productively engaged and to bring innovative ways of engaging young people to light. Coincidentally, this topic has been raised at a time when apart from the millions of unemployed young people in Nigeria, even more millions of youth have been thrown into idleness due to strike action and the summer holiday. If you understand that the youth population represents the strength of our country, then it is easy to see that this discussion is everybody’s discussion. As such, every young person, professional, policy maker, Nigerian in Diaspora, and Nigerian alike, is invited to weigh in on this discussion. We also invite persons and organisations interested in the issues facing Nigeria, Africa and youth development from the rest of the world. It is easy to leave a comment on the subject! Once you are signed in to your Facebook and Twitter accounts, you just make a post commenting on the issue including #EngageNaijaYouth in your statement. You could also join the main Twitter discussion moderated by @NaijaVolunteers on Sunday, August 11, 2013 (6-9pm). We’d be chatting with major movers and shakers and you do not want to miss this! Remember to include the hashtag, #EngageNaijaYouth, and @NaijaVolunteers in your posts. Coinaire Games would be giving out free recharge card after you have won an easy game at coinaire.com all day! -What functional youth associations and groups are there for young people to join conveniently? -Are there project outsourcing platforms that allow the youth work remotely? How can they be made effective and acceptable to organisations? -Can companies and other organisations effectively implement work shadowing and volunteering programmes for their Corporate Social Responsibility projects? What are the ways to successfully implement such? -What can be done to promote professional half-day, quarter-day, flexible, freelance and remote jobs? -How can we best structure Industrial Training programmes to achieve its objectives and achieve effectiveness? -What other engagements are available and can be created for the Nigerian youth? Some great people from our network of nation-building volunteers would be compiling the conclusions from this discussion and have it forwarded to the Federal Ministry of Youth Development and the office of the Special Assistant to the President on Job Creation. Start leaving your suggestions and comments immediately! +An influencer? Be our guest on the chat day! Leave a comment and we would be in touch.